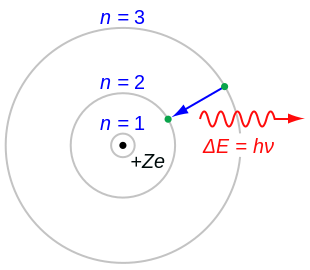 The Rutherford–Bohr model o the hydrogen atom (Z = 1) or a hydrogen-lik ion (Z > 1), whaur the negatively chairged electron confined tae an atomic shell encircles a small, positively chairged atomic nucleus an whaur an electron jimps atween orbits it is accompanied bi an emittit or absorbed amoont o electromagnetic energy (hν). The orbits in which the electron can traivel are shawn as grey circles; thair radius increases as n2, whaur n is the principal quantum nummer. The 3 → 2 transeetion depicted here produces the first line o the Balmer series, an for hydrogen (Z = 1) it results in a photon o wavelenth 656 nm (reid licht). In atomic pheesics, the Rutherford–Bohr model or Bohr model or Bohr diagram, introduced bi Niels Bohr an Ernest Rutherford in 1913, depicts the atom as a smaw, positively chairged nucleus surroondit bi electrons that traivel in circular orbits aroond the nucleus—similar in structur tae the Solar Seestem, but wi attraction providit bi electrostatic forces rather nor gravity. ↑ Lakhtakia, Akhlesh; Salpeter, Edwin E. (1996). "Models and Modelers of Hydrogen". American Journal of Physics. World Scientific. 65 (9): 933. Bibcode:1997AmJPh..65..933S. doi:10.1119/1.18691. ISBN 981-02-2302-1. This page wis last eeditit on 13 October 2018, at 16:55.